In 2014 I began developing a series of dream inspired images - inspired by work on the Sanctuary exhibit. ﻿Sanctuary, a word derived from the Latin sanctuarium, is literally a container for something. My sanctuary, the container for my soul, has always been, from as early as I can remember, the natural world, especially the mountains. It is a need in the depths of my being that leaves me out of balance and without a compass when I am away from the mountains for any extended time. So even though I traded my life in the Rocky Mountains of Colorado for Placitas, New Mexico, I have felt at home in the shadow of the Sandia mountains. When I die, just bury my ashes near a gurgling mountain brook in the shade of an aspen tree. There - in that sanctuary for the raptors, bears, cougars and ravens - my soul will be content. ​The exhibit was well received with Albuquerque Journal writer Wes Pulkka, saying "There are several excellent shows in Albuquerque these days but they all don’t have the “WOW” factor of the five-artist “Sanctuary: A Personal Journey” exhibition curated by Fernando Delgado now showing at the South Broadway Cultural Center. Patrick Nagatani, Holly Roberts, Joan Fenicle, Marie Maher and Delgado offer individualized and high-quality interpretations of the exhibition's theme ... The selection of works by Fenicle and their arrangement are drop-dead gorgeous. A triptych from her 'Running Water' series is a stunning example of landscape photography that illustrates her love of the mountains. Two pieces from her 'Lost in a Forest Dream' series beautifully reach into the surrealistic realm. Both works are printed on unstretched Habotai silk suspended from the top. The flow of the material and the imagery create the other worldly quality of a fading dream." Series 1: Running Water: originally archival pigmented ink on stretched canvas, now mounted on panel and finished with a coating of cold wax. a. Waterfall at Japanese Garden, Albuquerque, 8" x 24"
Series 2: Lost in a Forest Dream, originally archival pigmented ink on suspended Habotai silk, now mounted on panel and finished with a coating of cold wax. 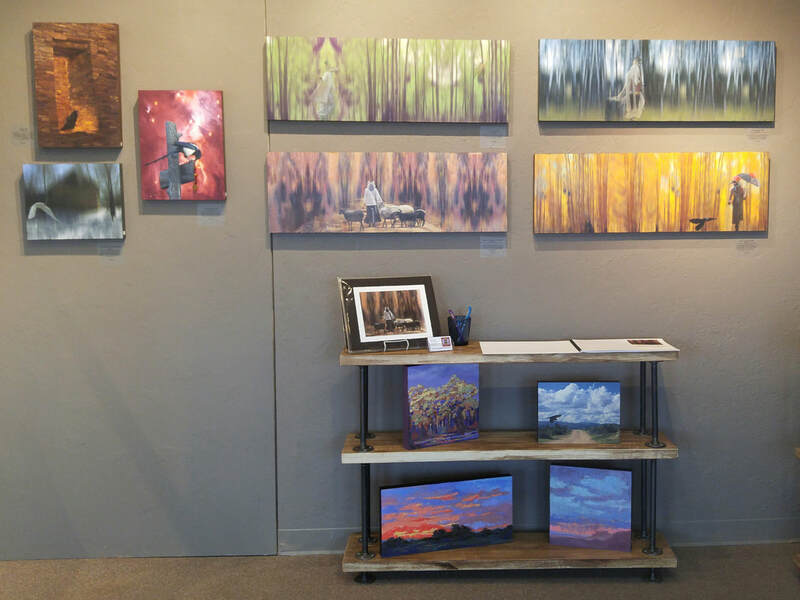 This view of the featured artist wall at Wild Hearts Gallery shows the Lost in a Dream series on the wall. There was also "dream book" in which people shared their interpretation of the images.